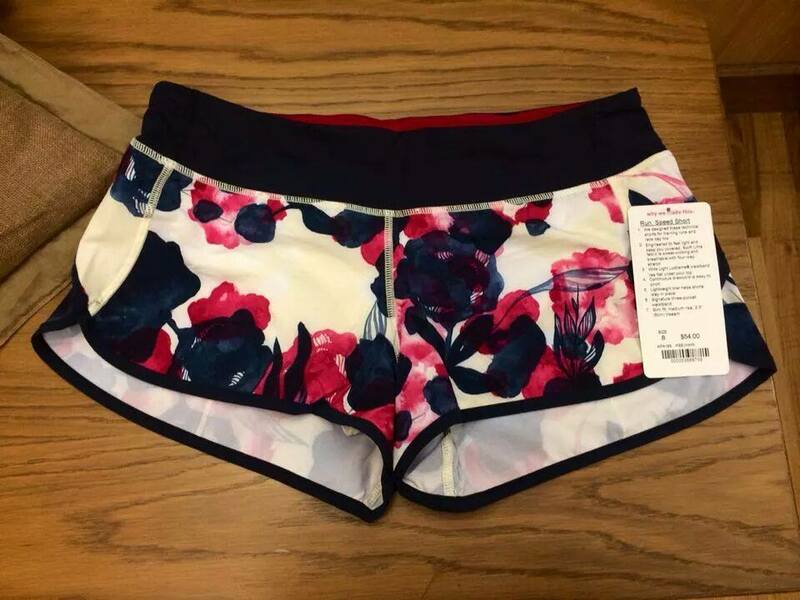 This popped up on one of my groups (thanks to Ms. M.) - a pair of Inky Floral Speed Shorts. I saw the Inky Floral Free to Be bra the other day in the store and the print is super pretty. that print is pretty. however, i'm thinking that pattern placement will be very important! They are beautiful. While I think speeds are flattering on I feel that they are a little too short for my liking. I wore my fatigue camo speeds last week for the first time and felt pretty self conscious in them. I saw the free to be bra too in the inky floral too. The light yellow used in the print looked like a bad stain that would not wash out. I will leave it up to your imagination what I thought the stain looked like. I passed. Oooh, those look nice. Are they 2-way or 4-way stretch? It is hard to tell from the photo. I love this pattern, but hate that I can't choose the pattern placement, as I don't have a store near my place and would need to buy online. I would love the print on a crb, but perhaps the pattern would stretch and fade out? Have a black yoga over skirt and SW both size 4, looking to get what I paid back, please contact internationalst at hotmail. I love the colors that we are seeing heading into fall. Finally some brightness. I do like this pattern, however, the BB with the Fuel Green reads Christmasy to IMO. Those, uh, look like a white pair of pants I wore when my period started. If the background color was different, then I'd say it was pretty. I like this pattern too. For various reasons I can't wear speeds though - are the Groovy Runs officially discontinued? I had been hoping so much for Groovy runs in ANY of the green or black based camo prints but nothing was made. Anyone know if non-speed shorts will be made in either of those prints? they are four way stretch! @ anon 11am - was the pace setter in the inky floral? i got the free to be this weekend and it is soooo gorgeous, i run in PS skirts not shorts - i'm so hoping we get the print in a skirt too! this is the first pattern i've been happy about in months - sooo gorgeous, it reminds me of old school lulu in the best way! Anon 11am- same at mine! and goodness i had nearly given up. I had hoped that is what they were up to after weeks of nearly empty stores with the newest items just being the same old with the latest dismal print. There is an Inky Floral, too. I don't have a photo of it yet but people have seen it. Anon at 12:17 - yep, the inky floral in the pace setter - they were putting it up on the display as I was there. I am a pace rival girl myself, but ended up getting the speeds. There were only two in my size so I picked the one with the pattern I liked best. Also, there was a new bag in - I didn't look closely enough at it - in a light yellow. Wonder if LLL will release a Scuba Hoodie ii in some version of the Inky Floral?!?!? Hi! This is going to sound strange, but do you own these in a size 8 and would you be willing to sell them to me? ?